I am determined to get Ellen Maria (the bigger boat) into the water this year. But that necessitated the retrieval of Blue Wing (the smaller boat), and cleaning her up. 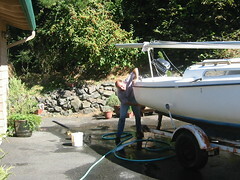 The Puget Sound is a healthy aquatic environment; and mooring for four months produces an abundance of marine growth on the hull of a boat. The bottom paint protects the bottom pretty well, but where the waves splash the sides a 'scum line' grows. After hauling the boat home this morning, I spent the afternoon scrubbing Blue Wing and getting her ready for winter storage. Hopefully, this means I will get Ellen Maria out on the mooring in time for a month or two of sailing before winter.